Hope 2013 is being kind to everyone so far! Just after Christmas I received a review on one of my note cards (available at Zazzle) from a customer and it reminded me that not everyone may be having as happy a holiday as they should. I know of a few people who had pet problems over the festive period and while not pleasant at the best of times Christmas makes it that little bit worse so I’d like to share the review with you. Perfect card for someone who has lost their furry child. 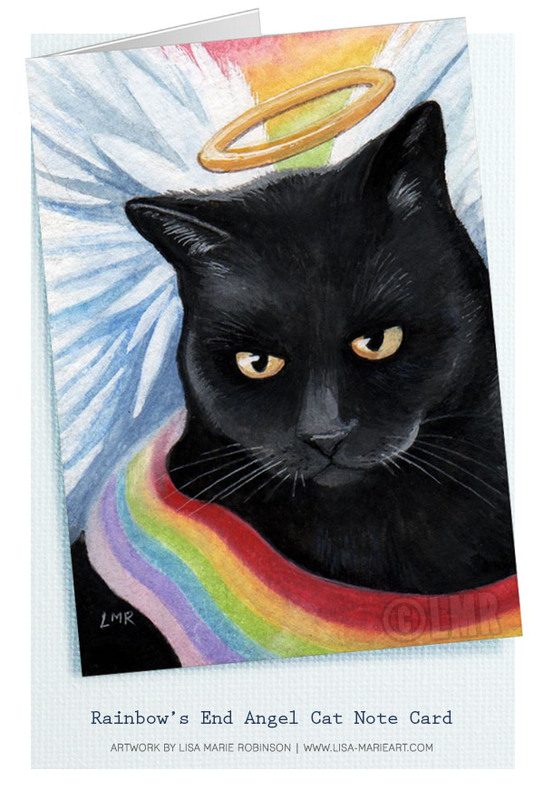 This card is amazing – from the beautiful artwork of an angel kitty, to the fact that you can personalize the message on the inside to say whatever it is you need to say, and in a very personal manner. If you’re comfortable doing that, this is much, much better than most any card you’ll find in the pre-made market – especially since “sympathy at the loss of your pet” cards don’t seem to really convey the proper sentiment when the pet in question was much more than a pet to their family. I just want to thank that customer for choosing and purchasing my card for their sentiments and for leaving such a thoughtful review. Thank you.